Oil Tanks, Propane Tanks, etc. The main responsibilities of a Volunteer Firefighter are to assist people in distress, rescue fire victims and extinguish fires as quickly as possible. To accomplish these goals, a Volunteer Firefighter must perform a wide range of tasks. Communities rely on Volunteer Firefighters to inspect and maintain fire trucks, ladders, hoses and other fire-fighting equipment. Volunteer Firefighters regularly inspect their equipment for cracks, leaks, holes and other signs of damage. In addition to fighting fires, Volunteer Firefighters also respond to auto accidents and other emergencies. When responding to a fire or accident scene, a Volunteer Firefighter may have to administer CPR or perform other first-aid procedures. With special training, a Volunteer Firefighter may also perform basic life-support procedures. A Volunteer Firefighter uses a variety of techniques to control and extinguish fires. Volunteer Firefighters use ladders, hydrants, hoses, fire extinguishers, and other tools to prevent fires from spreading. In some cases, a Volunteer Firefighter may have to enter a burning building to put out the flames or rescue fire victims. Volunteer Firefighters with the proper training may be called upon to drive fire trucks and other emergency vehicles. Some of our Firefighters use their own vehicles to respond to fires and accident scenes. Volunteer Firefighters help determine the cause of each fire they extinguish. If a fire is the result of arson, a Volunteer Firefighter may be called to testify against the perpetrator in court. Excellent interpersonal communication skills are a must for any Volunteer Firefighter. The position requires a great deal of contact with fire and accident victims, police officers and government officials. Because fires can rage out of control quickly, a Volunteer Firefighter must be able to make quick decisions. 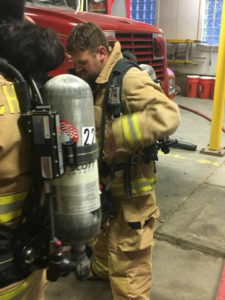 Advanced skills: Many fire companies do not require Volunteer Firefighters to have the following skills, but we saw several job listings that included them as preferred qualifications. Advance your career by learning the following.